Cebek I-108 module is a 230VAC thermostat with an operating range of between -10 to 60 ºC. 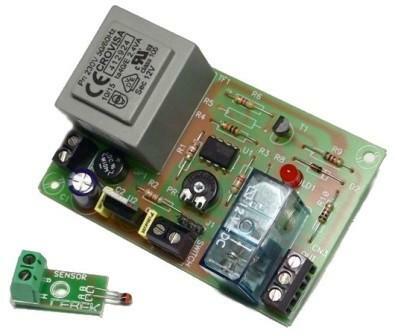 The module will activate the relay output when the temperature reaches the desired value. The temperature adjustment is made using a potentiometer mounted on the PCB. It also includes a indicator LED and connector to substitute for an external potentiometer.